Hi All, This is the first in a series of blog posts on books that changed my life. I hope that something here may be helpful in your own journey. This week I’m going to introduce you to Cal Newport’s theory of deep work. Then in the next two weeks I’ll review how he suggests you go about increasing your deep work and narrowing your shallow work. Newport suggests that deep work is especially valuable now, in an age of expansive knowledge work, where we must master difficult, complex things quickly. Within the current technology meritocracy, in which the best in the field can be hired from afar, the capacity to do deep work means that you can (and economically must to succeed) continually push yourself to be the best you can. Why is Deep Work Important Now? As Newport writes, the irony is that “the ability to perform deep work is becoming increasingly rare at exactly the same time it is becoming increasingly valuable in our economy. As a consequence, the few who cultivate this skill, and then make it the core of their working life, will thrive”. 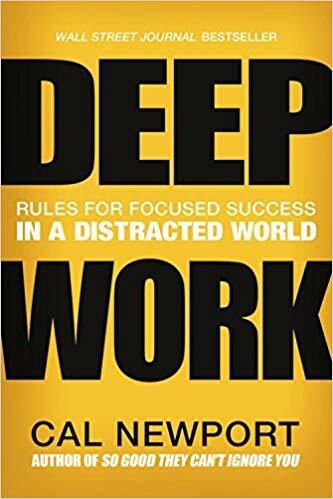 (p14) Further he suggests that deep work, work that is concentrated into distraction-free time blocks of high intensity, will produce work that is of higher quality and value than work which is fragmented and low intensity developed in a similar amount of total time. For example, Newport suggests that if my goal is to write a blog post on the problem with thinking your way out of pain, the product I create in one five-hour stretch with no distractions will be vastly superior to the product I would create if I wrote in five daily one-hour chunks with a variety of distractions such as answering occasional text messages and glancing at email regularly. He provides science in the book and my guess is you don’t need a lot of data for this example to make intuitive sense. Why does shallow work, and the work cultures and tech tools to support it, persist? So why does shallow work, and the work cultures and tech tools to support it, persist? Newport suggests these things “save us from the short-term discomfort of concentration and planning, at the expense of long-term satisfaction and the production of real value”. (p60) He goes on to suggest that in the world of knowledge work, in which products are increasingly complex, multifaceted, and dependent on the input and ingenuity of many, it can be proportionally difficult to measure the value of a single individual’s efforts and to clearly define, for the individual and the company, how that individual can demonstrate their value. Busy has become a convenient, if lazy and misguided, metric for productive. So how does this apply to my own small professional world, a world that may appear distant from the tech workers Newport references? What does it mean for me to be a valuable, productive psychologist or a valuable, productive author? Does it mean my practice is full of clients, I have a waiting list, everyone has heard of me, and I am busy busy busy? Does it mean that I write often, that my social media alerts ping frequently with likes and coveted retweets? As Newport so beautifully articulates, “Clarity about what matters provides clarity about what does not”. (p62) And this clarity of what it means for me to be a productive psychologist then guides how I focus my own deep work. This matches well with one of the key tenets of Acceptance and Commitment Therapy (ACT): values (or what you define as the things that matter to you) are a key north star for organizing and prioritizing your behaviors. Why would you endure difficult emotions, have hard conversations, or learn new interpersonal skills? Maybe you would do these things because the chance to succeed at something that matters to you is worth it. Note the overlap here with Duckworth’s grit hypothesis, in which a key component of grit is perseverance with direction – clarity about what matters and why you would keep bouncing back from difficulty. Newport’s argues that deep work is meaningful. He suggests, “deep work is at a severe disadvantage in a technopoly because it builds on values like quality, craftsmanship, and mastery that are decidedly old-fashioned and nontechnological”. (p69) Yet he also points out that deep work and the beauty of its products abound in many tech fields, from the elegance of a mathematical proof to the artistry of well-done code to the genius of a seamlessly designed user interface. Before the end of a therapy session, I will frequently say “are you up for homework?” If you are, why don’t you join me in paying attention to how much time you spend in a state of distracted attention or shallow work? I’m also downloading Moment, an app that tracks screen use, to track my own phone use over time. So this week I reviewed what deep work is and why it might be useful to your life. Next week I’ll share some of the ways Newport suggests we can expand our own deep work and some of the changes I’ve made in my own life.